DailyEdge.ie rounds up the TV shows that you’ll be tweeting about this weekend and talking about on Monday. Gibraltar v Republic of Ireland (RTE 2, 4pm) The first of the Euro 2020 qualifiers, with KO at 5pm from Victoria Stadium, Gibraltar. Ireland’s Got Talent (Virgin Media One, 7.30pm) More talent, in the final of the live shows. All Round to Mrs Browns (BBC 1, 9.15pm) No judgement here, if that’s your thing, a new series begins tonight. 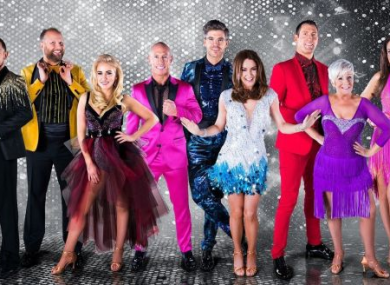 Dancing With the Stars (RTE 1, 6.30pm) It’s the grand finale tonight, Westlife perform and we finally find out who gets the trophy. Did You Hear About the Morgans? (Virgin Media One, 9pm) Rom-com starring Hugh Grant and Sarah Jessica Parker detailing a couple who get back together after witnessing a crime and are forced to relocate. Daniel and Majella’s US Road Trip (RTE 1, 9.30pm) Good clean fun, with the couple meeting the owners of South Dakota’s only Irish gift store, as well as visiting Mount Rushmore. The Jonathan Ross Show (Virgin Media One, 11.40pm) Guests include Kevin Hart, Tiffany Haddish, Rob Beckett, Dave Bautista, and Jess Glynne performs. Little Fockers (BBC 1, 10.35pm) The sequel to Meet the Parents, if you need a laugh. The Ray D’Arcy Show (RTE 1, 10.25pm) The chat show continues. The Voice UK (Virgin Media One, 9pm) Fill that singing contest gap in your life. Blue Planet Live (BBC 1, 8pm) A look at how are diverse oceans are coping with environmental pressures. Race Across the World (BBC 2, 9pm) The cross world travel adventure continues. Allianz League Sunday (RTE 2, 9.30pm) All the action from the day’s events.